Saturday, January 12, 1833.New Salem, IL. Lincoln writes for James Rutledge bill to James Odham for board and horse feed while Odham carried mail for year (1830-31), at $27.00 Bill is signed by James Rutledge and attested by Bowling Green.Photocopy. Monday, January 12, 1835.Vandalia, IL. Stuart introduces bill, in Lincoln's handwriting, for state road from Wabash River to Yellow Banks on Mississippi (which passes January 16, 1835. )An Act of the Illinois Legislature to Lay Out a State Road from the Wabash to the Yellow Banks of the Mississippi River, [12 January 1835], CW, 1:32-33. Tuesday, January 12, 1836.Vandalia, IL. Lincoln votes yea (31 yeas, 19 nays) on resolution instructing governor to sue public printer for failing to print complete "House Journal" and laws of regular session. After amendment, Gallatin Saline bill is read third time.House Journal. Thursday, January 12, 1837.Vandalia, IL. Lincoln's name does not appear in proceedings, but he is probably present to hear report on antiabolitionist memorials from six states. Report deplores slavery but denounces abolitionists for scattering "fire brands of discord and disunion. "House Journal. Friday, January 12, 1838.Springfield, IL. Lincoln writes and signs, for Stuart & Lincoln, a declaration and praecipe in Reed et ux. v. Arnold and Butler.Herndon-Weik Collection, Library of Congress, Washington, DC. Lincoln writes and files with the Sangamon County Circuit Court a declaration in Cannan v. Kenney, signing "Stuart & Lincoln for plff. "Herndon-Weik Collection, Library of Congress, Washington, DC. Saturday, January 12, 1839.Vandalia, IL. 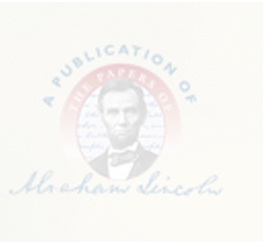 Lincoln presents remonstrance of Sangamon County citizens against division into four parts. On his motion it is referred to Committee on Counties of which he is member.House Journal. Tuesday, January 12, 1841.Springfield, IL. Lincoln answers two of four roll calls.House Journal. Wednesday, January 12, 1842.Springfield, IL. Lincoln writes and files complaint and praecipe in James Bell & Co. v. Walters. Joshua Speed was partner in trading firm of Bell & Co., plaintiff.Herndon-Weik Collection, Library of Congress, Washington, DC. Friday, January 12, 1844.Springfield, IL. Lincoln makes affidavit that Nathaniel Hay is about to commence suit in chancery in Sangamon Circuit Court against Nicholas Bryan, Sr., and that Bryan does not reside in Illinois. He writes bill in chancery in case, to have lots sold at auction.Herndon-Weik Collection, Library of Congress, Washington, DC. Monday, January 12, 1846.Springfield, IL. Supreme Court grants continuance of Wren v. Moss et al. Argument is opened in Griggs et al. v. Gear by Chickering for plaintiffs.Record. Tuesday, January 12, 1847.Springfield, IL. Lincoln writes agreement on transcript of record in Cooper v. Crosby and Robbins, filed in Supreme Court. Photocopy. Wednesday, January 12, 1848.Washington, DC. Lincoln attacks Polk's war policy. He defends his "spot resolutions" and attempts to disprove Polk's contention that Mexicans began war. "The President is, in no wise, satisfied with his own positions," he declares. ". . . He is a bewildered, confounded, and miserably perplexed man. God grant he may be able to show, there is not something about his conscience, more painful than all his mental perplexity! "Globe; Speech in United States House of Representatives: The War with Mexico, 12 January 1848, CW, 1:431-42. Friday, January 12, 1849.Washington, DC. Lincoln attends House, for his name does not appear on list of absentees. Journal. Sunday, January 12, 1851.Springfield, IL. Lincoln writes to his step-brother John D. Johnston, of Charleston, Illinois, about Lincoln's father Thomas, who is gravely ill. Lincoln explains that his work and his wife's "baby-sickness" prevent him from being with his father. Lincoln "is doubtful whether it would not be more painful than pleasant" for him and Thomas to "meet now." Lincoln reminds Johnston to "use my name, if necessary, to procure a doctor, or any thing else for Father." He asks Johnston to remind Thomas to "confide in, our...merciful Maker; who will...not forget the dying man, who puts his trust in Him." Abraham Lincoln to John D. Johnston, 12 January 1851, CW, 2:96-97. Monday, January 12, 1852.Springfield, IL. Lincoln and Blackwell lose Tuller v. Voght. Circuit court decided that Tuller was liable for $1,000 damages for broken leg sustained by Voght when he was knocked off his horse by coach and four driven by Tuller's coachman. Supreme Court reverses decision and remands case with permission to Voght to amend his declaration. Record; 13 Ill. 271-77. Wednesday, January 12, 1853.Springfield, IL. Thursday, January 12, 1854.Springfield, IL. Friday, January 12, 1855.Springfield, IL. Lincoln buys pair of gloves and sewing materials for Mrs. Lincoln. Pratt, Personal Finances, 147. Saturday, January 12, 1856.Springfield, IL. Lincoln spends day preparing his argument in mandamus case. Abraham Lincoln to Charles Hoyt, 16 January 1856, CW, 2:328-29. Monday, January 12, 1857.Springfield, IL. William H. Bissell, first Republican governor of Illinois, is inaugurated. Evening celebration is held. Gustave Koerner makes first speech. Lincoln is among those who follow him. "The speeches were all characterized by great good feeling, and the enthusiasm of the audience often vented itself in rounds of applause." Illinois State Journal, 13 January 1857. Tuesday, January 12, 1858.Springfield, IL. Lincoln participates in several cases in the U. S. Circuit Court. In the case of Emmitt v. Barret, Lincoln & Herndon represent plaintiff James Emmitt. Judge Samuel H. Treat hears the attorneys' arguments regarding Emmitt's demurrer to defendant James A. Barret's plea. Emmitt is suing Barret for failure to repay a promissory note. Lincoln and Norman H. Purple represent plaintiff Lloyd Powell in two cases, Powell v. Kern and Powell v. Ament & Beer, both involving a dispute over some land located in Adams County. Lincoln and Purple file a declaration and a notice in each case, and Lincoln signs documents naming himself as a surety in the cases. Lincoln and Purple ask the court to order the defendants in both cases to "plead...in twenty days, or...his default be entered." Judge Treat grants the requests. In the case of S. C. Davis & Co. v. Miller, Lincoln & Herndon represent the plaintiff company, which is suing John B. Miller to recover the money Miller owes on an unpaid promissory note. Miller fails to appear in court, and Judge Treat declares Miller in default. Judge Treat orders the court clerk to assess the damages in the case and then orders Miller to pay that amount, $1,635.97, to the company. Order, 12 January 1858, Emmitt v. Barret, Record Group 21, General Records, Vol. 1, 244; Declaration, filed 2 January 1858, Emmitt v. Barret, Record Group 21, case file 279; Declaration, Notice, filed 12 January 1858, Powell v. Kern, Record Group 21, case file 311; Declaration, Notice, filed 12 January 1858, Powell v. Ament & Beer, Record Group 21, case file 723; Clerk's Docket, 12 January 1858, Powell v. Kern, Record Group 21, [Clerk's] General Docket, Vol. 1, fol. 63; Clerk's Docket, 12 January 1858, Powell v. Ament & Beer, Record Group 21, [Clerk's] General Docket, Vol. 1, fol. 63, all in U. S. Circuit Court, Southern District of Illinois, all in National Archives and Records Administration, Great Lakes Region, Chicago, IL; Bond for Costs, 12 January 1858, Powell v. Kern, Lincoln Memorial University, Abraham Lincoln Library and Museum, Harrogate, TN; Bond for Costs, 12 January 1858, Powell v. Ament & Beer, Record Group 21, case file 723; Order, 12 January 1858, Powell v. Kern, Record Group 21, General Records, Vol. 1, 245; Order, 12 January 1858, Powell v. Ament & Beer, Record Group 21, General Records, Vol. 1, 245; Assessment, [12 January 1858], S. C. Davis & Co. v. Miller, Record Group 21, case file 255; Order, 12 January 1858, S. C. Davis & Co. v. Miller, Record Group 21, General Records, Vol. 1, 246; Judgment Docket, 12 January 1858, S. C. Davis & Co. v. Miller, Record Group 21, Judgment Docket, Vol. 1, fol. 18, all in U. S. Circuit Court, Southern District of Illinois, National Archives and Records Administration, Great Lakes Region, Chicago, IL. Wednesday, January 12, 1859.Springfield, IL. Lincoln loses VanBrunt & Watrons v. Madux when jury finds for plaintiffs and assesses their damages at $2,320. He files bill of exceptions so that case may be taken to U.S. Supreme Court. Files. Lincoln buys "Isinglass" and "Red Gelatine" at his drug store. Pratt, Personal Finances, 152. Thursday, January 12, 1860.Springfield, IL. In Supreme Court, People v. Illinois Central RR, filed February 1, 1859, comes to trial. Logan argues case for plaintiff, Lincoln and J. M. Douglas for defendant. Court takes it under advisement, and later finds for defendant. 27 Ill. 64-70. Lincoln deposits $75 in his bank account. Marine Bank Ledger. He trades in his old buggy to his carriage maker, for $9.25 credit on his account, and pays $18.25 cash. Obed Lewis Account Books. He writes $5.90 check to "Canedy & Johnson," druggists. DLC—Original. Saturday, January 12, 1861.Springfield, IL. An impromptu presentation of handsome, richly ornamented, gold-headed cane is made to Lincoln this morning in business office of St. Nicholas Hotel by returned Californian, an old friend and client. Chicago Tribune, 14 January 1861. Lincoln is called upon by old Indiana farmer named Jones, for whom 30 years ago he worked as common farmhand at $1 per day. Chicago Tribune, 14 January 1861. In letter to Sen. Seward (N.Y.) Lincoln reveals that he is trying to get at least one Southerner in cabinet; also informs him that there is "scarcely any objection" to him as secretary of state, but that there will be trouble over "every other Northern cabinet appointment." Abraham Lincoln to William H. Seward, 12 January 1861, CW, 4:173. Hawkins Taylor, Republican from Keokuk, Iowa, shows Lincoln postscript of letter from Col. Warren supporting Senator Cameron (Pa.) for cabinet. Taylor to Cameron, 12 January 1861, Simon Cameron Papers, Library of Congress, Washington, DC. Lincoln withdraws $3.30 from Springfield Marine Bank. Pratt, Personal Finances, 175. Sunday, January 12, 1862.Washington, DC. Lincoln receives unexpected visit from Gen. McClellan. McClellan, War for Union, 156. At 1 P.M. convenes another meeting of Gens. McDowell, Franklin, and Meigs, Secs. Seward and Chase, and Postmaster Gen. Blair. Adjourns meeting until tomorrow, when McClellan will be present. Diary, Montgomery C. Meigs Papers, Library of Congress, Washington, DC. Interviews Dr. Fuller, clergyman from Baltimore. Harris to Lincoln, 12 January 1862, Abraham Lincoln Papers, Library of Congress, Washington, DC. In evening Sen. Browning (Ill.) calls at White House. Lincoln thinking of taking field himself. Has several plans. Browning, Diary. Monday, January 12, 1863.Washington, DC. President and Sec. Stanton in morning conference on army affairs. Abraham Lincoln to Edwin M. Stanton, 12 January 1863, CW, 6:55. Lincoln instructs Judge Adv. Gen. Holt to revise proceedings of courtmartial in case of Gen. Fitz John Porter, on trial in connection with failure of Gen. Pope's campaign, August 1862, and to report on other aspects of trial. Abraham Lincoln to Joseph Holt, 12 January 1863, CW, 5:54. Acknowledges receipt of resolutions of Connecticut Legislature favorable to administration forwarded by Gov. Buckingham (Conn.). Abraham Lincoln to William A. Buckingham, 12 January 1863, CW, 5:54. Senator Charles Sumner (Mass.) calls on President at night and reads letter from George Livermore of Boston acknowledging receipt of pen used by Lincoln to sign "New Years" proclamation (Emancipation Proclamation). Frank Leslie's Illustrated Newspaper, 31 January 1863; Daily National Republican (Washington, DC), 7 January 1863, 2d ed., 2:4. Mrs. Lincoln borrows "Why Paul Ferroll killed his wife" from Library of Congress. [Mrs. Caroline Wigley Clive, Why Paul Ferroll killed his wife, London, 1860.] Borrowers' Ledger 1861-63, 114, Archives of the Library of Congress, Library of Congress, Washington, DC. Tuesday, January 12, 1864.Washington, DC. President establishes western base of Sierra Nevada Mountains relative to construction of Central Pacific Railroad. Order Fixing Western Base of Union Pacific Railroad, 12 January 1864, CW, 7:122. Cabinet meets, with three members present. Welles, Diary. "The President's reception this evening passed off very pleasantly, although not so largely attended as usual. . . . President Lincoln appeared in excellent health." New York Herald, 13 January 1864; Daily National Republican (Washington, DC), 13 January 1864, 2d ed., 1:7-2:1. Lincoln devotes salary warrants, August 1863, September 1863, October 1863 and December 1863, to purchase of $8,000 Treasury notes. Pratt, Personal Finances, 183. Transmits to Senate communications regarding "alleged exceptional treatment of Kansas troops when captured by those in rebellion." Abraham Lincoln to the Senate, 12 January 1864, CW, 7:123. Thursday, January 12, 1865.Washington, DC. President interviews Mr. Duncan of Montreal, who has a discovery for protection of wood against fire. Abraham Lincoln to Montgomery C. Meigs, 12 January 1865, CW, 8:213. Receives Mrs. Maria Davis of Pennsylvania, and grants conditional pardon for her son. Order Concerning David Levy, 12 January 1865, CW, 8:213-14.